3.3.2014. [Cont'd from 2/2/14] Our quilt-along project moves slowly -- three blocks per month. 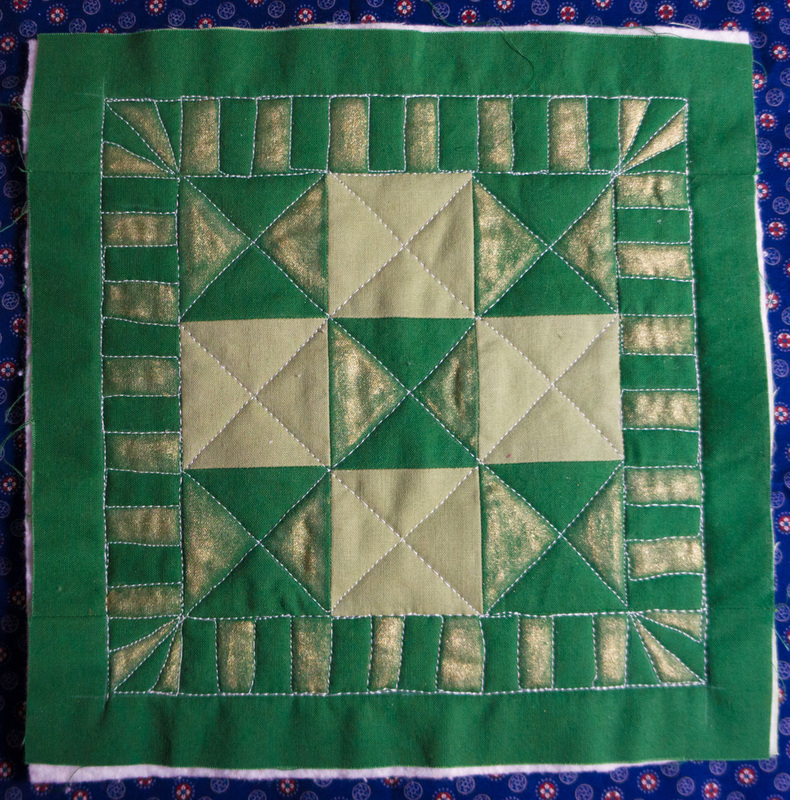 The idea is to practice free motion quilting on 10" sandwiches of pieced top, batting, and backing. Leah posts a how-to video, then films her husband struggling to reproduce her refined work as a beginner. More than 1000 quilters from around the world participate in the Facebook group and many post their progress and their learning struggles for mutual support and celebration. 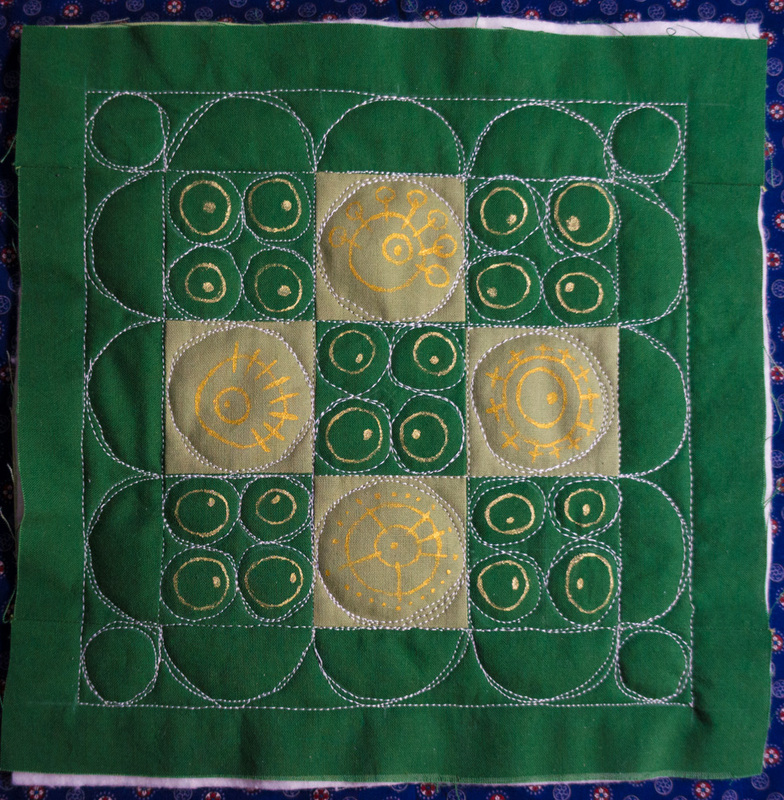 Free-motion quilting (FMQ) on a sewing machine is the opposite of hand-quilting. 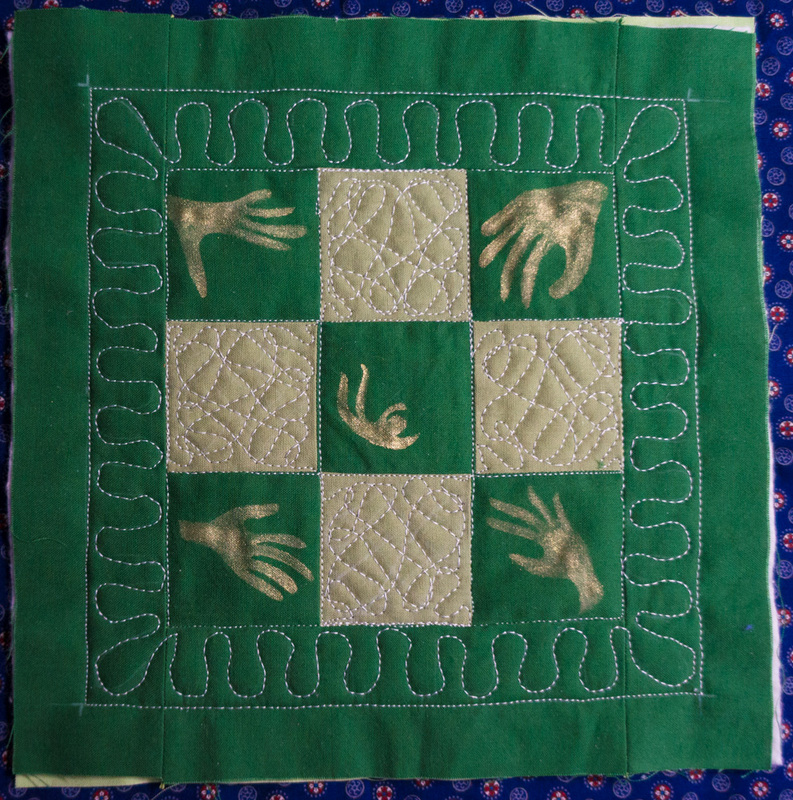 The act of hand-quilting is slow and meditative. You sink into your chair, swaddled in your creation. With FMQ, you are on the edge of your chair, driving a stock car on a convoluted track, needing close coordination among foot pedal speed, eye tracking, and hand motion -- focus, focus, focus! Because I was a little bored/dissatisfied/impatient with the look of my January set, I decorated them with gold Lumiere fabric paint. It made my work stand out a little (and you know I love applause) but it also committed me to painting on ALL 42 blocks. So that was my activity for yesterday afternoon. Block 2.1 (above) got its border checkered, which is a look I always like. The paint is semi-opaque and thinly applied. I think that's okay -- the effect is a little glitter-grungy, in harmony with my wonky lines. Block 2.2 was all about circles (below). I masked my incompetence by sewing around and around and around for a "look." I puzzled over how to adorn this one, so basically, I just grabbed a small brush and did Susan-doodles. Block 2.3 went back to wiggly U-shapes and freehand spaghetti fills. I went back to my homemade stencil to add hands to the plain blocks. Then I couldn't resist my little character in freefall for the center. No particular larger meaning about the hands of fate. The idea just made me smile.